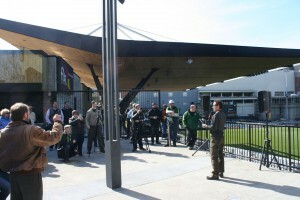 Another jewel was added to the necklace of public art installations in Portland, Oregon on Friday, March 9, 2012 when a sculpture entitled “You Are Here” was unveiled at the newly-renovated Jeld-Wen Field soccer stadium. 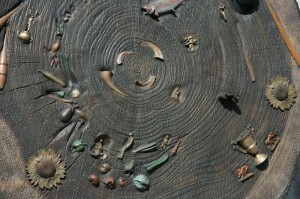 The cast bronze sculpture, created by Brooklyn, New York artist Ron Baron, depicts a 9-foot diameter slice of a tree trunk, complete with growth rings and edged in rough bark. 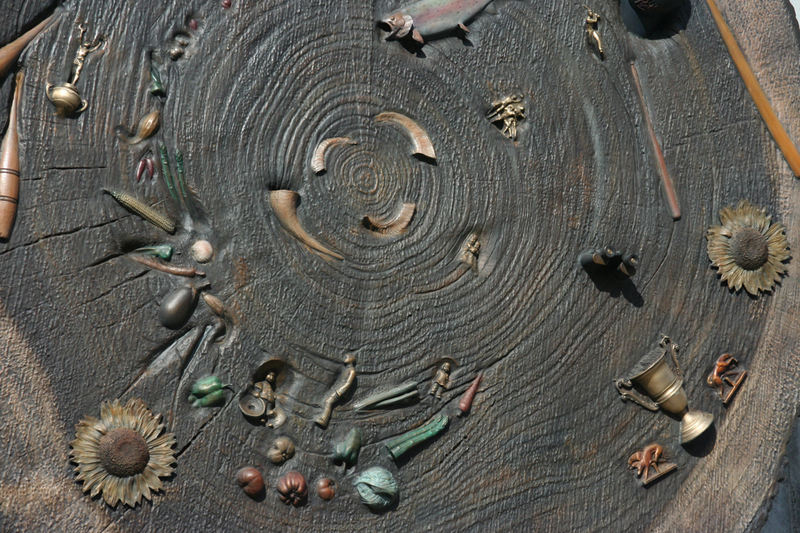 The face of the slab is embellished with small sculptural figures and sundry embedded items, all of which reference the history of the stadium site and surrounding Goose Hollow neighborhood. Intentional or not, the piece also speaks to the lumber industry that sustained Oregon’s economy for a century and helped to build Portland into a great city. Baron’s inspiration for the artwork came while attending a Portland Timbers’ soccer game, where he witnessed the long-standing ritual of the team’s mascot, Timber Joey, cutting a slab from a log with a chainsaw each time the team scores a goal. The slabs are presented to the goal-scoring team members after the match. The Timbers soccer club originated in 1975, playing first in the North American Soccer League; then later becoming part of the United Soccer Leagues. In 2011, the team was raised to Major League Soccer (MLS) status. 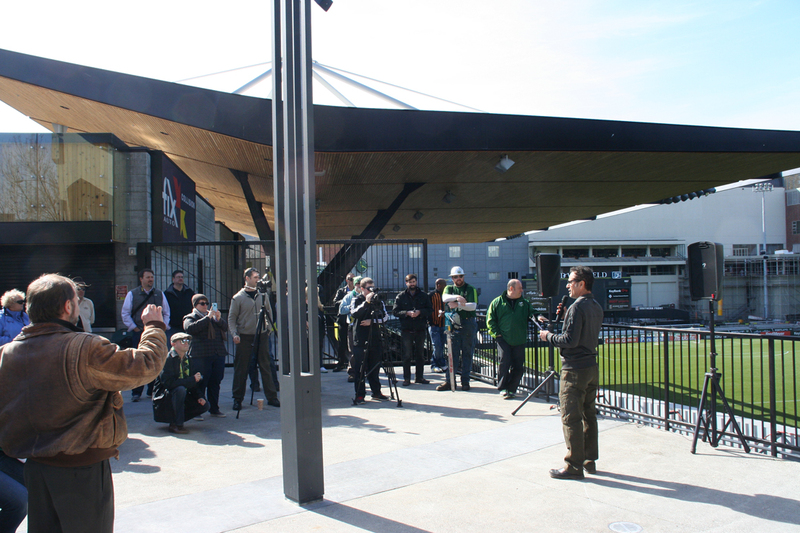 Part of the effort to bring MLS to Portland involved renovation of the former PGE Park baseball stadium to a first-class soccer field. The facility was originally built in 1926 as Multnomah Stadium. The name was changed to Civic Stadium; then later re-named in honor of sponsor Portland General Electric (PGE). During its recent metamorphosis, the name was changed to Jeld-Wen Field for one of the Timbers’ major sponsoring organizations. Over past decades the stadium has hosted numerous sporting events including football, cricket, baseball and soccer. It was once home to dog races and has also staged concerts including one of the first outdoor rock concerts ever held when Elvis Presley performed there in 1957. The stadium is also home to about a dozen feral cats. 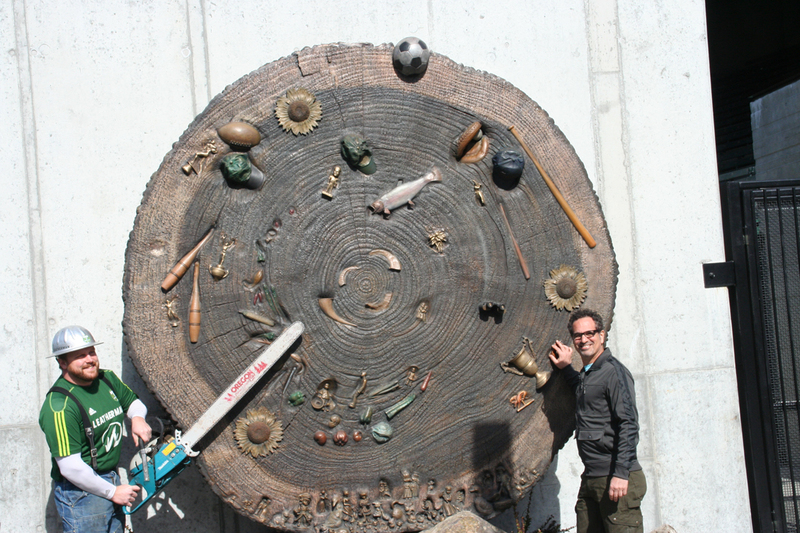 The purchase of Ron Baron’s sculpture was supported by the Percent-for-Art program, administered by the Regional Arts & Culture Council. 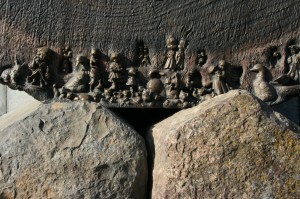 Construction projects involving public funding built in the City of Portland or Multnomah County are subject to a policy requiring that 2 percent of the budget be spent on permanent public art installations. The program began in 1980 and has since contributed over 100 permanent artwork installations within Portland’s central core alone. “You Are Here” is a highly-appropriate selection for its location, and a welcome addition to Portland’s astounding and eclectic collection of public art.